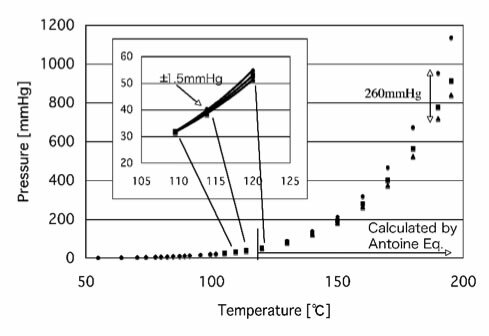 The most basic thing that many engineers were aware of that is Boiling point varies with Vapour pressure, and i'll bet you that many of those Engineers donno the exact reason for this, and today i'll reveal that under hidden reason for that behavior of solvents. For that you should be aware of some damn basic things like what does exactly Vapour pressure, Boiling point means. What is Vapour Pressure ? Vapour Pressure means the pressure exerted by the vapour on the surface of liquid at equilibrium, Usually vapour wont have any Vapour pressures, the vapour pressure is the property of solvents, every solvent will have their respective vapour pressures. Boiling point is nothing but a point of saturation where the vapour pressure of a solvent equals the atmospheric pressure, simply toluene is a solvent, whose boiling point is 110.6°C, and at that boiling point the vapour pressure of toluene will be 760 torr, [Dont get confused Torr means mmHg only]. And same is the case with every solvents boiling point. Right now, you got a clear idea of the Vapour Pressure & Boiling point, So now i'll start my show about describing the relation ship between Vapour Pressure and Boiling point, the only relation that describes the relation between these two parameters is Antonie Equation. By using Antonie equation we can calculate the boiling point of solvent at different pressures, it also means that the boiling point of solvents will decrease with Vacuum, and we can calculate it theoretically. In fact, this is the first calculation that i've learned after joining the Pharma Industry. P is Vapour Pressure, T is Boiling point. Just remember one thing, while selecting the Antonie constants, there are many set of constants available, and they will vary with the units of Pressure that you choose. Many of the Pharma Operations will include "Distill off solvent under vacuum below temperature X°C" , here while they include word vacuum just because we can distill off the solvent below its regular boiling point. the Vacuum should be NLT 650 mmHg, so the pressure should be P = 760 - 650 = 110 mmHg. Solving for T, T = 54.4°C. So, this means at 650 mmHg the boiling point of Toluene will be 54.4°C, which means it came down from 110.6°C to 54.4°C. how you calculated T value? if you know the vapour pressure just insert in Antonie equation, and solve for T, that's it....!!! thanks for ur valuable post. For selection of P value, do we have to substract required Vacuum (i.e.,650mmHg in case you have considered) from 760 mmHg or the atmospheric pressure at the given location (for example ~720mmHg in Hyderabad)?? correct, you need to subtract from atnospheric pressure, i.e., 760 mmHg. Atmospheric pressure varies with sea level.Then, how do we consider that? please go through the post, and try to calculate the atmospheric pressure at different locations based on height of sea level. Casually i've mentioned atmospheric pressure i.e., 760mmHg.